One veggie capsule contains the equivalent of the active ingredient, allicin, in garlic of 35 cloves of garlic. 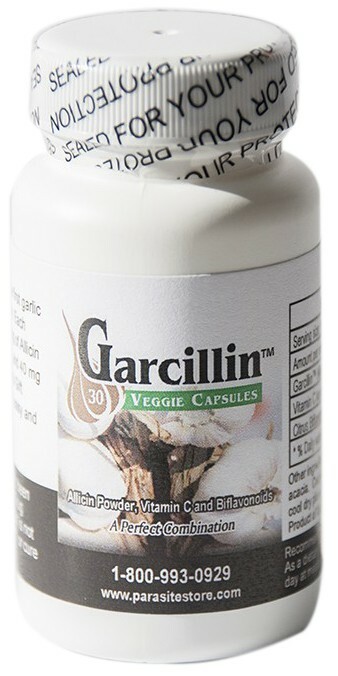 Gacillin™ One veggie capsule contains the equivalent of the active ingredient, allicin, in garlic of 35 cloves of garlic. Allicin is said to be, by it's formulators, antibiotic, aniti-viral, anti fungal, anti protozoan, and anti parasitic properties. While Garcillin™ is a derivative of garlic, it is not garlic in it. Garlic supplements have no allicin in them. If you have not used allicin yet, we recommend starting on this formulation and when you get to four capsules a day then switch to Garcillin II--our more powerful formulation. FDA regulations require me to inform you that our Garcillin product is not a treatment or cure for any disease. Use at your discretion.